Gillian Redmond is a rare type of musician. Fresh out out of a degree in music, but is taking every step to fullest by only writing songs’ which is in parallel with her current thoughts. Redmond say’s she plans to embark on writing music which travels to a deeper level of thought and meaning eventually. But for now her songs’ are about the most recent thought in her mind. And the chances are, the next time you speak to Redmond, she will be talking about her latest Netflix experience or a cult episode of the Simpsons. One automatically thinks a Harp player in 2018 is on a vigorous journey to keeping in style with European symphonies’. Keeping a tight profile based on classical themes and philosophies. Instead her style of music is more pop based influenced, tied with harp harmonies’. Redmond is writing music in the current mode of her life. This is not say she does not have plans to move on to the more serious themes and ideas life throw’s at us. It is about developing the right song that respects her current social situation. And who can blame her? Don’t we all catch up on Brooklyn Nine Nine or Queer Eye (Redmond’s personal binging choice), after finishing our studies and enjoy any activity, without the procrastination. Our chat begins with an informative lecture about just how stressful creating a harp sound can be. Harps are heavy, one of Redmond’s Harps’ is roughly fifty Kilograms. She even had to buy a spacious car so she can transport it around town. And there very few places in Australia whom provide Harp strings’. And Redmond has lost new strings in the mail, adding to the stress. I totally enjoyed hearing Redmond’s newest EP, AART. Redmond has correlated string harmonies, infused with synth beats to match the structure of a typical pop song. It gave light to new style few can claim to of heard before. As much as my appreciation is growing for AARP with every re-listen, and it’s definitely one of the more experimental EPs I have heard this year. But learning the stresses that come with giving a life long commitment to such an instrument, I just had to ask the question, why the harp? Redmond knows she loves the playing the harp, but sometimes we just don’t why we love something. After a few minutes of probing her brain as to why she play’s the harp, she kept coming back to the original answer “It just sounds good”. Redmond did explain, that from a very young age, she just had a strong unbreakable to connection to the harp, stating “it was one of those weird kid things”. Although Redmond claims her song’s are anything but serious and philosophical she has some very strong thoughts’ about music the industry. Event organisers have tried to sidestep paying her, by offering exposure and networking instead of paying, “They're not real things, it doesn’t pay my bill’s” she stated. And she is more than capable of throwing strong questions and ideas out there to be discussed. Such as, a what stage does an artist lose their creation to the public, Redmond will tell you any creation comes down to how you interpret and it’s what you take away from it. But she can also sympathise with the creator if their creation does not get interpreted quite the way they would like. My intuition tell’s me, this is just the start of life long journey Redmond is taking to creating something special. I believe she is taking the ideas as they come at the only correct pace, her pace! Rather then take the clear linear line to achieve immediate fame and fortune, most are taking. Not that it’s about fame of fortune for her, but she is taking the time to explore and analyse every step in the field, and covering the whole field. But hey! 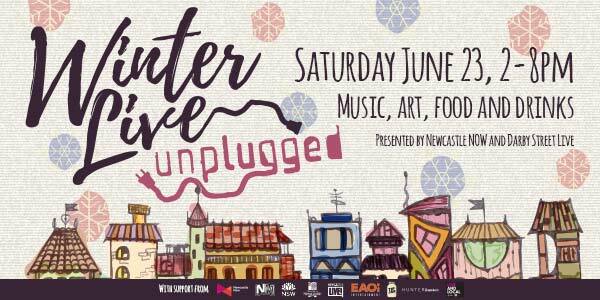 Don’t take my word for it, get on out to “Winter Live: Unplugged - A Day indoors on Darby” on Saturday the 23rd June where Redmond is playing at Scout By Abicus. And as Redmond would say, if you want to know what her music is about, you’re gonna have to check it out yourself. 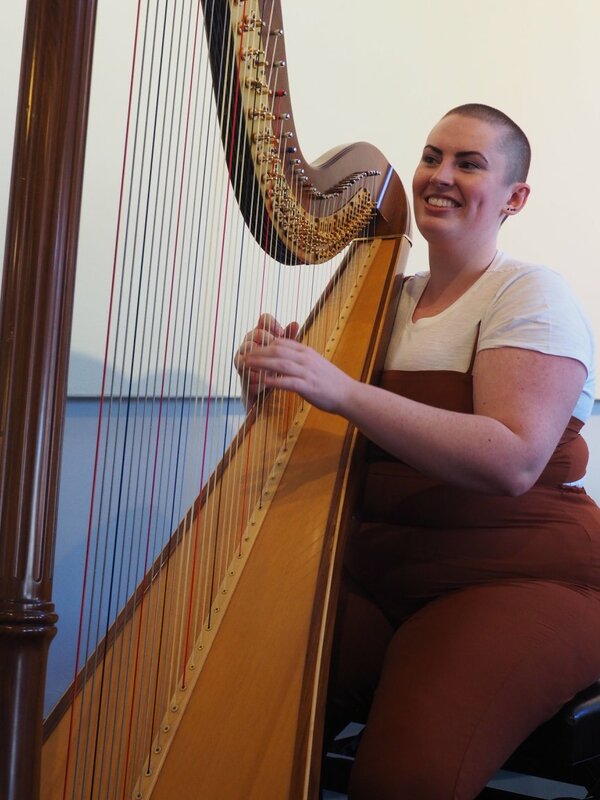 This article isn’t going to do justice, you will have to interpret Gillian Redmond’s Harp playing for yourself by getting to Darby Street on the 23rd. William Gleeson is a music Journalist and Webcaster. He is the producer and presenter of the local music program 'Indie Collective" on Tuesday nights from 7pm.